It might surprise you to know that I used to be a bit of a poker player. Not the smoky backroom with shady characters in a seedy bar kinda stuff. I just played for fun and the challenge of the game – not real money. Most people think that winning at poker is a mix of luck, skill and psychology. But in truth, it’s really just about 2 things: 1. Understanding the odds, and 2. Discipline. You lose in poker the same way that you lose in life – by letting your emotions, and not your intelligence, dictate your actions. The most successful poker players, for instance, only actually play about 10-15% of the hands that they are dealt – the hands that they know have a good chance of winning. The rest they just fold – and wait. They play with their brains – not their hearts. Those who consistently lose at poker will try to triumph with almost every hand they are dealt. They play with their hearts (emotions), not their heads, and they end up losing almost every time. They think that they are just unlucky and keep hoping that one day their luck will turn. It never does. That’s how most of us approach our lives too. We re-act to situations in ways that do not have a good chance of turning out well. We say things that we know we shouldn’t have said. We do things that we know we shouldn’t do. But we can’t help it. We’ve become too accustomed to letting our emotions, and not our intelligence, lead us along. 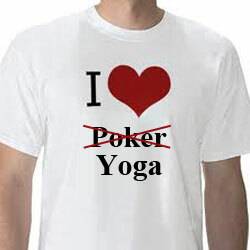 Poker taught me two things long before I even knew what yoga was; it taught me to know what the best course of action is to take, based upon the facts (odds) and not upon my wishes; and it taught me to develop the discipline to act appropriately. As Swami Gitananda reminded us, yoga is about knowing the right action to perform, in the right way, and at the right time. To be able to do that – to develop the wisdom to know what the right action is and the ability to perform it in the right way at the right time is what separates the amateurs from the pros in life, so to speak. One thing is for sure in Poker – if you don’t have a clear understanding of the situation, and if you lose your composure, it won’t be long before you’re broke and out of the game. If only life was so straight forward! But it isn’t. We humans seem to have a knack for slow learning – for falling into the same pit over and over and over again before it finally dawns upon us to step to the side of the path! (some folks never get it!). Learning non-action (and not speaking), or how to take a more careful approach to many of life’s situations is a big step in consciousness. As yogis, we know that karma (a big topic that we’ll leave for another day) underlies every situation in life, and what “needs” to happen is not always the same as what we “want” to happen – something that is never apparent to the average person. Of course, you don’t have to make this leap in awareness. There will always be room at the poker table of life for those who just can’t resist living life blindly, hoping that some day their luck will change.